WASHINGTON -- Whether you buy it or not, psychics have been around for centuries, and have recently garnered new attention with the popularity of the NBC show "Medium." Police can be reluctant to embrace them as a crime-solving tool, and equally reluctant to ignore them. A local case involving a crime-solving psychic happened in the summer of 1992, when 23-year-old Laura Houghteling of Bethesda was missing. Police couldn't find her and couldn't find key evidence to link her disappearance to suspect Hadden Clark. Then Montgomery County detective Rich Fallon got a call from a psychic. "And advised us we need to look at a wooded area between two churches," Fallon said. Off Old Georgetown Road, in a wooded area between two churches, they found it -- Houghteling's bloody pillowcase with Clark's fingerprints on it. The case was closed. "It could have been luck, but I like to think on the other side this was a medium helping us out," Fallon said. 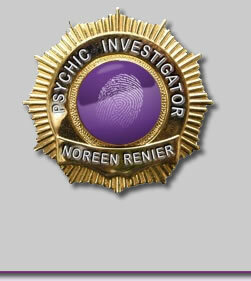 Noreen Renier is a police psychic. She's not the one who helped the Montgomery County Police, but for 28 years she has worked with police departments around the country. The police send her something the victim was wearing when murdered. She then goes into a meditative state and "reads" it for clues, often re-living the crime as the victim. "I've had my throat slit, I've been stabbed in the head, I've been burned. It's called psychometry -- the ability to read the energy or aura of an object to learn the history of its owner," Renier said. Renier calls it a sixth sense that resides in a little-used hemisphere of our brains. "We all have it. I wish I was special. I'm not special," Renier said. But others think she is. The boxes sent to her from detectives and desperate relatives reveal the visceral signs of violence or the sad remains of the disappeared. "Missing people are much harder. I'd much rather do homicides. Missing people are gone. What they had on is gone. So I have to be super psychic to go through," Renier said. She records her readings because she intentionally forgets the experience. "If I had recall, I would go out of my mind. But the next, day I don't remember anything," Renier said. And she usually keeps her talent in the off position, so she isn't reading everything around her. 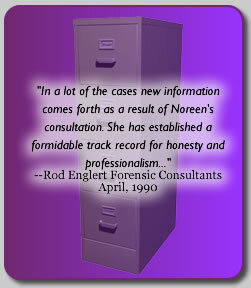 Going through her many files, sometimes her readings are news to her. "A cat missing? Someone had a missing cat? I actually did a reading for her damned cat!" Renier said. And unlike the character on "Medium," Renier is not haunted by ghosts. Like most psychics, Renier has attracted her share of critics and skeptics. But, when killers are getting away, other's say it's good to look beyond the edge to find justice for the dead.